Portable Nitrogen Generators are an easy and convenient way to produce high purity Nitrogen gas from the field, in an emergency scenario, or in a mobile unit. Compact, portable Nitrogen Generators can produce high purity Nitrogen at low flow rates using a straightforward Nitrogen Generator technology and a self contained compressor, with an attached N2 storage tank. The portable N2 Generator simply uses the available air supply around it to separate out the Nitrogen gas and send it to the storage tank. Mixed Beer Gas - the portable N2 GEN is incorporated into the BeerBlast™ Mixed Beer Gas Dispense System, a compact system designed especially for restaurant, bar, and stadium draft beer service. This system will eliminate over-carbonation, improve beer taste and quality, and increase profits. Nitrogen Tire Inflation - South-Tek Systems' patented TireBlast™ Nitrogen Tire Inflation System uses the N2 GEN to generate Nitrogen gas for automotive and tire shops. Nitrogen tire inflation helps maintain more consistent tire pressure, increasing a vehicle's safety, gas mileage, and life expectancy. Corrosion Prevention - a portable Nitrogen Generator is installed with the MICBlast™ FPS Corrosion Inhibiting System to help combat and eliminate galvanized corrosion and microbiologically influenced corrosion (MIC) threatening dry and preaction Fire Protection Systems (FPS). Nitrogen Based Smoke - Nitrogen gas can be used to generate smoke for fire simulation machines. 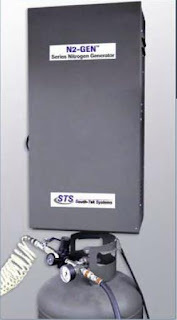 South-Tek Systems uses the N2 GEN portable Nitrogen Generator in its patented SmokeBlast™ Nitrogen Based Smoke Machines for Fire Simulation and Fire DepartmentTraining. As you can see, there are a wide variety of uses for a portable Nitrogen Generator. You can also learn more about the uses of stationary, small Nitrogen Generators. To inquire about the N2 GEN for your particular application, please contact South-Tek Systems today: 888-526-6284. They have experience across a number of fields and can outfit a portable Nitrogen Generator for your express purposes.